FREEWAY FRONTAGE COMMERCIAL-MIXED USE-HIGH DENSITY RESIDENTIAL LAND! Zoned MUA-HHDR, this land has many allowed uses including stores, offices, residential up to 40U per acre. Priced to sell! Located across the freeway from many newer homes, and just a mile south of the huge Terramor master planned home development under construction. More homes are reportedly planned across the street around the lake and on the 12 acres for sale ¼ mile south by this broker. This 4 acre freeway frontage land is midway between the famous Temecula wine country and the booming industrial city of Corona. Sycamore Creek Shopping Center is across the freeway, Dos Lagos shopping mall and 15 screen theatres are just 2 exits north. Several Golf Courses are within a few minutes drive. 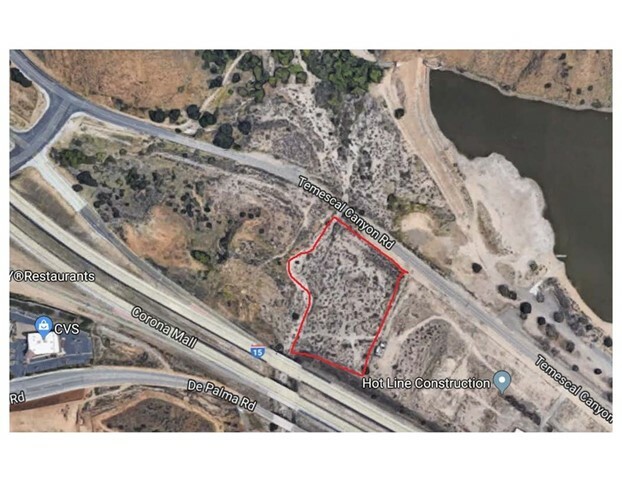 Possibly the most affordable freeway frontage commercial-high density residential development land in southern California!